Norman Gladden recalls how a new draft of men arrived at the 11th Battalion, Northumberland Fusiliers near Ypres in 1917. The battalion had suffered considerable casualties at the Battle of Messines on 7 June 1917. The nature of the new arrivals shows how conscription was bringing older men into the army and how battalions were losing their regional identity. It also demonstrates how dangerous it was to be a member of an infantry battalion in World War I – many of those Gladden mentions did not survive. 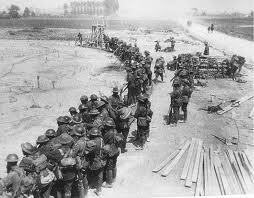 ‘A large draft from home had now joined us to fill the gaps left by the recent battle. They were all new to active service and had much to learn, a mixed group, coming from all parts of Britain. Among those I was to come to know very well were Tom Ireland, tram conductor from Bradford, old to us in his forties, with whom I was to maintain friendly correspondence right up to the eve of the Second World War, and Isaac Doniger, from Leeds, a kindly generous Jew whose friendship I treasured until his death in 1965. There was also [Ernest] Canelle, a well-educated Second Division Clerk in the Civil Service, destined to take the place of Jimmy Downs and Harold Eldred in my affections. (As an example of our addiction at that time to surnames, I mention that I do not recollect his Christian name). These new-comers were homely folk, a sample of the ordinary men of England, who were not awed by their new surroundings. Ready to learn and to respect the service of those who had already seen so much that was still hidden from them, they were quickly to be admitted to this new society and made to feel at home. Two other members of this new group I remember well, though they never entered the inner circle of my acquaintances. One was Broome, probably in his thirties – he seemed old to us – a tubby, short, good-natured chap, whose great love of his missus beamed habitually from his countenance. He came from t’Potteries and ended most of his sentences with the phrase ‘ther knowst’. This entry was posted in Soldiers of the Great War, World War I memoirs and tagged 1917, Belgium, books, Centenary of World War I, conscription, memoirs, Messines, Norman Gladden, Northumberland Fusiliers, Soldiers of the Great War, Ypres. Bookmark the permalink.